This level has medium difficulty. 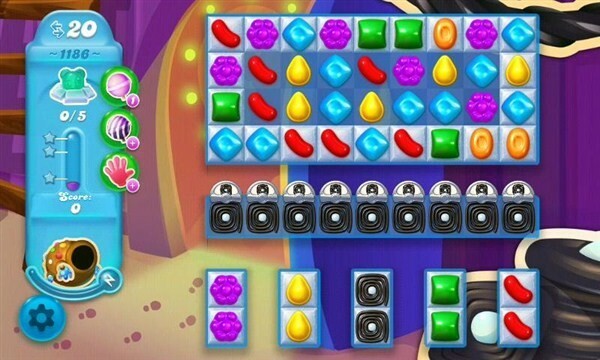 For this level try to play from top part of the board and make striped candy. Combine them with other special candy to break more snow blockers or play near to snow blockers to break them to find the bears. I’ve been stuck on this level for 2 weeks! Still can’t figure it out..Help!!! Hello try 3 freaking months! This level is too difficult.after weeks of playing with only 1 bear found. Love love soda crush but just don’t get this level, can only get 1 bear! It’s impossible to win this level. It’s been 10 days & I need help otherwise I’ll give up. Good to read comments above! why are you frustrating those that have been enjoying playing this for many years? I have never received the moves like this video & when a fish is created it does not uncover the bears! Very unrealistic walk through video. I’ve been on this game for about 4days and I never get the combinations this video gets. Two bears are the most I have gotten. It’s beginning to be a job instead of a game. Candy Crush Soda 1186, is ultra hard. I hate it. It’s rediculous. Wish I could skip it and move on to the next one. Shame on you for thinking of it.